So you know how some people will say: “It was so much fun I pissed my pants!” or others might say: “That scared the piss out of me!” ? Welp – that’s the kind of weekend I had! Lots of wet pants. My sister set up the new huge trampoline in the backyard last week – you know – when it looked like it might really be Spring? – just in time for the litte one’s birthday party on the weekend. Luckily Saturday turned out to be the NICE day and we all got a chance to jump. Can I just tell you? I can’t remember the last time I had that much fun! I cleared all the kids out and went to town, windmilling my arms higher and faster, forcing my body to SOAR! I was laughing and laughing and jumping and jumping and I pissed my pants. Literally – pee came out. THAT’S HOW MUCH FUN IT WAS! The party was great and we all had fun and then Sunday night I got the opportunity to have the piss scared out of me. It was late and I was having trouble sleeping what with all the wind and the rain and I had finally fallen asleep. Then – CRACK – CRASH! I bolted upright! What the hell was THAT? I listened. Nothing. I waited for the others to come running. Nothing. I checked for wetness – whew! Nothing. (Although I was sleeping in the waterproof princess bed, just in case.) Eventually my heart stopped pounding and I went back to sleep, figuring that it was just the wind. The next morning we found the branch across the backyard and the hole in the roof of the garage. Thankfully it missed the house. Quite the weekend of extremes. I’m ready for some nice weather now. Any time Mother Nature is ready. I applied Ruth’s method by using the Stained Glass Filter in PhotoShop. I’m pretty happy with how it worked out! 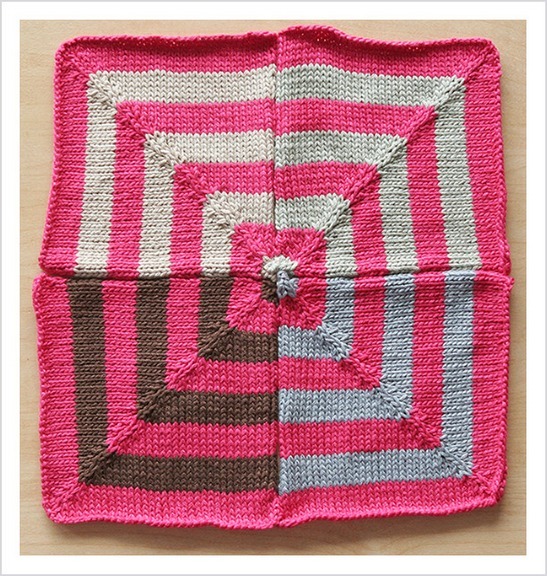 I’ve got four (or nine) more squares to go – and I may just try this exercise again. I just love how the dark chocolate brown sets off all of the bright colors. 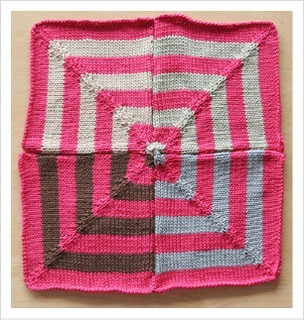 You’ll be happy to know that Square #21 is half finished. Thank you again for all your comments and opinions on my post about blog behavior. I’d like to reiterate that I welcome constructive criticism. I understand that my opinions are one in about 6.5 billion – opinions, it turns out, really ARE like assholes. My blog life is VERY charmed and while it IS hard work and occasionally people like to rain on your parade, I’m not going anywhere anytime soon. At least as long as it takes to sew up all these miters. Have a great day! Beautiful miters, Cara. And aren’t trampolines fun? But wow can you get tired fast! I’m always reminded that I’m not in as good physical shape as I think I am. 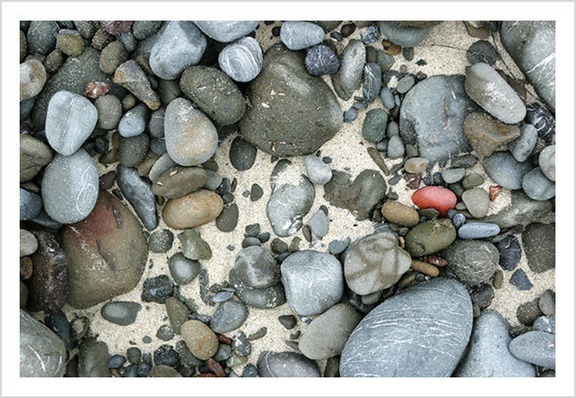 Brilliant use of the best colour choices- those from nature. I’m amazed at how fool proof, yet stunningly unexpected colour choices this process brings. MORE MORE! 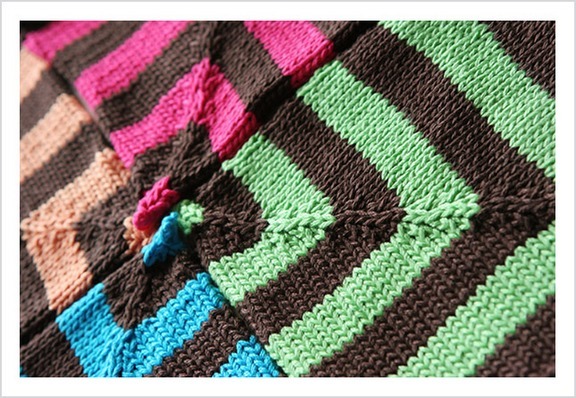 Square #20 reminds me of those chocolate covered mint sticks….my mouth is watering!! Your fiber art in always sooooo gorgeous! I can’t imagine anyone leaving a negative message on a blog that is so full of positive energy. Thanks for my Tuesday bit of happiness. I was tempted to whip out the cell phone camera to take a picture of the hospital curtains when DH had surgery last week… a soft teal, baby blue, khaki and white, which I think would make a lovely miter! That’s what the colors that make you happy immediately made me think of. I want to eat that square. Was Square # 20 possibly inspired by the birthday festivities? I see chocolate cake with decorations and frosting! 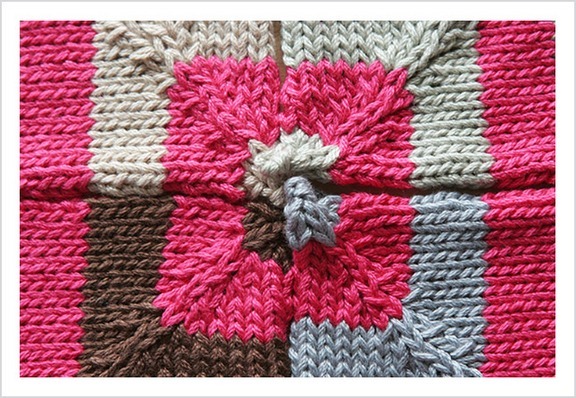 I love the pink in the first square, but the chocolate brown one is stunning! I love the way the brights play off of the brown. Congrats on getting both of the squares done. It sounds like you had quite the weekend! That is too pretty for words! I hate big projects, and I hate cotton, but you make me want to make one of these, too! I really like Ruth’s method; I need to find time to play with that. It would also be great for the beading I do. I think the square you did with that might be my favorite. But I really like the chocolate based one, too! Yup, you’ve just knit up my Easter candy stash. I have to say that the picture that loaded as your header for me today is just indescribably beautiful. It’s the one that’s the base of a pink flower, wet with some rain or dew. It’s just amazing! Square #20 is my favorite so far. It makes me happy, too. love that transfer of the nature colors to the miter – I’m doing a talk on wildlife friendly landscaping for an Earth Day event this saturday – just reminds me we really just need to turn to nature for all kinds of things. The brights are fab (and more to my usual taste) – just makes you want to eat it up!! But then you’d be short a miter! Love your blog, ditto, ditto, ditto – everyone else has said it so well!! Please don’t go away – hmmmm – can you picture yourself still doing this at 70?? I can’t wait to see where we all go!! Thank you for revealing some of the ways you find colour combinations. I’m going to have to start taking more photos for inspiration… and then I’ll have to acquire more yarn in the colours to combine. Dammit. The Bearfoot colours are so dark, but so beautiful. Perhaps the combinations will look subtle. Still loving the miters Cara!!! I’ve had the trampoline/pee issue. It’s so much fun though that I’d do it again! Holy Moses! These are my favorites so far. That chocolate just sends me- my old dining room was Chocolate Truffle. I adore how it sets off those colors. The red/pink is amazing…I looked at it and thought “Lover’s Leap”! I like your method for determining color schemes. 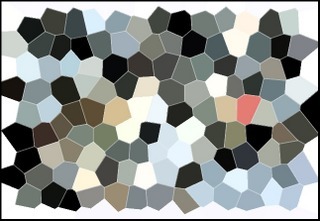 This website does a pretty good approximation of the technique, and they let you save your color scheming for future reference. Love the mitre – I’m awfully fond of chocolate brown with just about everything. I’m so frustrated that my free trial version of Photoshop isn’t compatible with the Vista upgrade – guess I’ll have to buy it sight unseen. The mosaic feature looks cool. Oooohh…I think #20 is my favorite miter square to date. Whoo Hoo! I’m glad to hear you are feeling good about blogging again. You really are special. I mean how many other knitters would tell us laughingly about their pee problems? The miters are looking great, do you think you’ll be able to stop? I love them! They are my favorite two spares yet…especially #19 (but then I am partial to rose). Glad you had so much fun! Great post – and I’m a 22 yr. old, childless example that sometimes things are just too funny for your bladder to handle. I like to think positive – I’m glad I have the opportunity to laugh that hard. I love that you put your method of color choice here – I like when you describe the process! LOVE the new squares! I love the idea of using the stained glass filter (wish I had Photoshop!) to pick out colors. 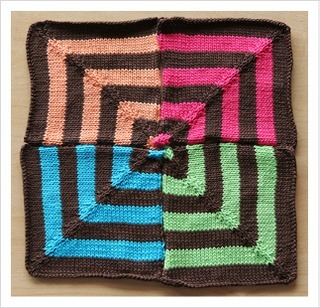 And the chocolate brown/brights square? Stunning! LOVE chocolate brown, my favorite color! While I love all of the squares, I think square 19 might be my favorite. I long for some knitting involving those colors. Your blanket it going to be wonderful! I like the top one so much. I love how that one pink stone just demanded to be more. Wait til you have 4 kids. Breathing causes you to pee!! Love the squares!! You kill me talking about peeing your pants. I did the same thing recently. Now I can’t even remember what was so funny, but it hasn’t happened since, so hopefully you’re good, too. I love how you put the photo through Photoshop and it gave you that peach and you decided you liked a WHOLE LOT of pink, instead. The squares came out very well. I love that chocolate brown, too. LOVE how you came up with square 19. (I haven’t gotten to Ruth’s blog yet.) And square 20 is just gorgeous. By the way, it thrilled my soul to see your comment on my fledgling blog. Thanks! Unfortunately, my mitering is on hold as the yarn store I went to last week had no Cotton Classic. I’m headed to another one this weekend. Don’t forget to do the Kegels whenever you’re waiting for the light to change. so, it’s all sorts. that’s the name of the candy. furthermore, I don’t know why I typed 29 when I meant to type #20. And isn’t it funny how lots of people think that square looks like food? I absolutely love square #20! It’s fantastic!! I am such a huge fan of chocolate brown with bright colors. 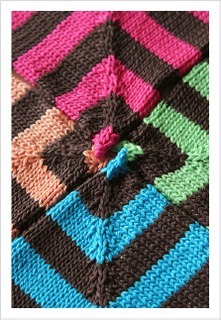 I used those colors in my very first knitting project, a scarf that I designed well before I knew what I was doing. My brother kept telling me that brown with all those bright colors was “ugly”, but I didn’t believe him! I’m glad to know I’m not alone in that! I think one of these days I’ll remake that scarf, mitered-square style. Thanks for the inspiration! I am greatly enjoying all of your miters, but particularly these two – I am looking forward to playing with this program – thanks! And the trampoline… ahh, yes… had a blast on one last year and found the same problem – leaking – some fun, huh? Ooh, I think that #20 is my favorite thus far!! I am really enjoying watching you do this! wow, those are great. I really like the bright colors on the second one. Aren’t trampolines the best? We got one of those big ones right before I left home for college. I remember that it made me pee my pants a little bit too. I think it is just the bouncing and gravity and the whatnot. Cause really, I was only 18, it couldn’t have been age-related. Love, love, love the miters. Although I think they might be even more fun if they were spelled mitres. #19 is really nice and I love how you chose the colors but. . . . MAN is #20 G O R G E O U S!!! I am so happy that is was just the garage. Last year at my niece’s birthday we had a big jumper. It was great. We had kid time and then it was the adults turn. My two sisters and one brother and I had a wonderful time. It is important for us grownups to “play” once in a while. Square 20 is my fave miter thus far, nice job! The “stones” miters are my favourite so far. I really love the method to aquire the colours too—very clever. I’m really enjoying the miters. I’d think about making one myself if it wasn’t for the sewing up! Ahh, Cara, you’re so cute! Oh man, I love love love love #20!! Trampolines? Braver soul than I, you are. wow – the miters just keep getting better Cara. I love visiting your blog and seeing what you’ve come up with. I am trying the photofiltre technique to try to come up with some colors for an afghan (not mitres) that I want to start. Mitre On!! Those are gorgeous! I absolutely love the way they turned out! I agree with those above who said the second one looks like chocolate mint sticks or some other kind of candy. Delicious! Your miters are very inspiring! I think I’m going to make me a couple of squares as well. Both of those miters are shockingly beautiful. Love them more and more each time! And I’m so glad you got to enjoy a trampoline. I think the pee is a normal thing. Also, I think you got a bunch of us readers doing kegels when we read your post, and I think that’s hilarious. I LOVE the brown/vibrant color combination… so cool. I keep wondering about people who have so much to choose from in their stashes (as you seem to)… Do you have that many colors of the same brand of yarn, or do you mix and match brand/weight/fiber type? I totally love those miters! i gave my littlest brother a box of 64 crayons, and he and my uncle and i had a really big discussion about the amazing powers of chocolate brown. ha! I think #21 is my favorite so far!! I just made the turtleneck tank from Fitted Knits in brown and pink cascade 220 (similar shades to those in your square). Love it! Is THAT what that exercise is called?? I’ve been doing that since I was 19-20 but because in the Dominican Republic this is known to tighten your muscles for the sexual reasons part. LOL It’s called Coco Mordan there. Is it just me, or do all those miters look like they’re kissing where they come together in the corners?